NOTE: This post is rated PG-13 for mild strong language and intimations of substance abuse. This post, simply enough, is about curing the hiccups. I examine the existing literature on the topic (okay, some of it), point out the flaws inherent in traditional cures, and then unveil my simple remedy, which works 100% of the time and is demonstrably superior to all others. In a perfect world, I’d have a research staff large enough that at any given time one or more researchers would have the hiccups and could test out these methods. Instead, since I barely have one researcher (and he’d rather write than conduct research), I’ll have to settle for citing personal experience. The answer is, who cares? Okay, that’s not much of an answer, but then it was a rhetorical question to begin with. Sure, there are plenty of explanations afloat, usually involving the vagus nerve, the diaphragm, and/or the esophagus, but these explanations are about as satisfying as the Big Bang Theory—that is, not at all. Suffice to say, everybody gets the hiccups, some people more often than others, and that’s just the way it is. Okay, there is a valid reason for understanding what causes the hiccups, which is to avoid getting them in the first place. But I’m convinced that avoidance is a fool’s errand. My older daughter used to get the hiccups a lot while she was still in the womb. If, in utero, she’d gotten the hiccups whenever her mom did, we’d be on to something. But there was zero correlation, and I cannot imagine that there’s much overlap between what goes on in a uterus and what goes on in the outside world. Hiccups just happen. No, by “consumption cures” I don’t mean cures for tuberculosis. I’m talking about the hiccup cures that require you to consume something. There are two main websites I’ve consulted for this post: “Reader’s Digest” and “How Stuff Works,” and they both start off with a classic remedy: eating a tablespoon of sugar. “How Stuff Works” recommends an antacid. This seems like overkill. How about Benadryl, so you just sleep through the hiccups? Or maybe heroin, would that work too? “Reader’s Digest” goes on to recommend peanut butter, honey, powdered cocoa, dill seeds, and hot sauce (though not all at once—these are discrete remedies). Hot sauce is a laugh, because “How Stuff Works” tells you to avoid spicy foods. (Never mind that avoiding something is a preventive measure, and this was supposed to be a list of cures.) Many times I’ve gotten the hiccups from spicy salsa, but it’s absurd to avoid an entire cuisine on that basis. Say you’re going out to eat with friends or family, and everybody wants Mexican: are you really going to say, “No, we can’t do Mexican, I might get the hiccups”? Yeah, right. The problem with all these cures is that hiccups can strike at any time, and any place. It’s just not practical to carry around dill seeds or vinegar with you. You need a cure that travels with you all the time, even in the bathtub. Remedies abound that involve drinking water, usually with some weird twist like drinking upside down, or trying to put your mouth on the far edge of the glass. I’ve watched my kids try many variations of this, none of which seem to work and most of which make a mess, particularly if a hiccup occurs during swallowing. My older daughter has tried drinking through a paper towel (which turns out to be one of the “Reader’s Digest” recommendations) and says it works, though her mom put the kibosh on it for health reasons. It does seem likely that there are chemicals (bleach, perhaps?) in paper towels and you wouldn’t want to ingest them. Now my daughter drinks water through a coffee filter, which her violin instructor recommended. (“If there’s one thing you can’t do when you have the hiccups, it’s play the violin.”) This seems like a fine solution, except a) coffee filters cost money, and b) once again, you’re not always going to have them around. I don’t know how this “scare away the hiccups” myth got started. I’ve tried to scare the hiccups out of a great many people and it never, ever works. For example, a couple decades ago I had a girlfriend who got the hiccups constantly, and it drove me crazy, so one day while we were walking along the sidewalk, she hiccupping as usual, I suddenly screamed as loud as I could. It wasn’t a terrified type scream—more of a James Brown type scream—but it certainly packed a punch: she screamed too (the terrified type scream), and then started crying, and kept hiccupping through it all. Besides, even if the scare method did work, it requires the action of another person, which means it relies on somebody else deciding to help you. It’s not like you can ask somebody to scare you—with the element of surprise gone, what’s he going to do? Pull out a gun? Respiration-related techniques are classics. As a kid I tried holding my breath countless times and it never did a damn thing. I’ve watched lots of other people try this one and it never works. It just makes you look like an idiot, with your cheeks puffed out and your face all red and then you hiccup anyway. Anybody who recommends this pointless, totally ineffective remedy deserves the hiccups he’ll still have after doing it. To my astonishment, both “Reader’s Digest” and “How Stuff Works” recommend breathing into a paper bag. Don’t they know this is how lowlife teenagers get high? I have no idea whether or not this remedy works, nor do I care. I’d rather have the hiccups than overdose on carbon dioxide and pass out. What’s next: curing hiccups by huffing model airplane cement? My research did turn up two rather novel approaches for curing the hiccups. 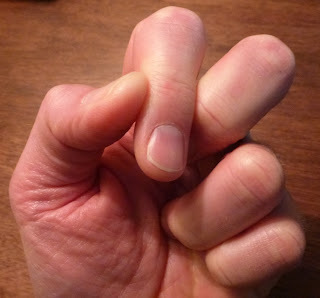 The first is on WikiHow and goes like this: “Press hard onto the palm of a friend/family member’s palm for 30 + seconds. This gets rid of their hiccups if they are taken by surprise.” I have several problems with this. First, since when do palms have palms? Second, even if it works, this technique doesn’t get rid of your hiccups; it gets rid of somebody else’s. It requires the element of surprise, which you’re not going to get if you ask somebody to do it for you. What are you supposed to do, tell them about it ahead of time and say, “If I ever get the hiccups, here’s what to do”? And what if you get the hiccups on a bus or train, with no friends around? My final issue with this technique is that it’s one of sixty-six methods listed on this website. If any one of these actually worked, we wouldn’t need sixty-six of them. WikiHow has about as much credibility here as “Cosmopolitan” with its perennial lists of bedroom man-pleasing techniques. You do this with both hands. How long do you need to squeeze? Well, that’s up to you: simply for as long as it takes for you to realize that your hiccups are completely gone. I guess I’d give it about ten seconds. When I do this, the hiccups go away so quickly that there’s never even a second hiccup. It’s brilliant: immediate, silent, simple, and requires absolutely nothing but your two hands. Maybe this cure is like using the touch-screen keyboard on a modern smartphone. When I first got my Droid, I could barely type my unlock password—it would take me three or four tries. 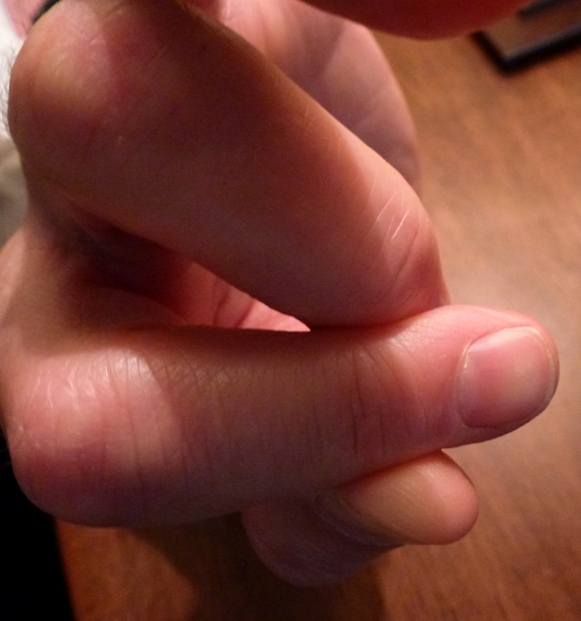 I was convinced my fingers were just too stubby. But soon enough I developed the same knack that all the other touch-screen typists seem to have and I’m surprised how fast I can go. I (reluctantly) must report that this cure doesn’t work for my daughters, but then, their manual dexterity is highly specialized. They can play the piano like the dickens but are helpless when it comes to a knotted shoelace or even a tangled jump rope. The older one is being phased in to dishwashing duty and it’s painful to watch her try to scrub a pot; she couldn’t do worse if she used her feet. So I guess what I’m trying to say is, if you don’t have success with this technique, there must be something wrong with you. Look, I don’t know anything about pressure points or yoga and I’ve already admitted I have zero knowledge in, and zero curiosity about, the actual biomechanical cause of the hiccups. I don’t know why this trick works and I don’t much care. My advice to you is not to question this cure, and not to doubt it ... just do it. It really does work. What else are you going to do? Carry around a little baggy of dill seeds wherever you go?